Parks and Recreation is an American mockumentary comedy television series created by Greg Daniels and Michael Schur which follows Leslie Knope, the deputy head of the Parks and Recreation department in the fictional town of Pawnee, Indiana. Knope takes on a project with a nurse named Ann to turn a construction pit into a park, while trying to mentor a bored, college-aged intern. From Emmy Award-winning executive producers Greg Daniels (The Office, King of the Hill) and Michael Schur (The Office, Saturday Night Live) comes a new mockumentary that looks at the exciting world of local government. The half-hour comedy examines the mundane but necessary ways that people interact with their government, and ask why it's frequently so complicated - as everyone knows from standing in line at the DMV, applying for home construction permits, or trying to get the city to fix a pothole. The documentary cameras follow Leslie Knope (Amy Poehler), a mid-level bureaucrat in the Parks and Recreation Department of Pawnee, Indiana. In an attempt to beautify her town - and advance her career - Leslie takes on what should be a fairly simple project: help local nurse Ann Perkins (Rashida Jones) turn an abandoned construction pit into a community park. Opposing them are defensive bureaucrats, selfish neighbours, real estate developers and single-issue fanatics - whose weapons are lawsuits, the jumble of city codes and the very democratic process that Leslie loves so much. Leslie is alternately helped and undermined by her colleague, Tom Haverford (Aziz Ansari), who cheerfully exploits his government position for personal gain. She is also thwarted by her boss Ron Swanson (Nick Offerman), who is philosophically opposed to government in any form. Helping Leslie and Ann navigate the Pawnee bureaucracy is charismatic city planner Mark Brendanawicz (Paul Schneider), whose outlook has been soured by 15 years of public service. If they can pull it off, Leslie hopes that she also will have inspired her uninterested college intern April (Aubrey Plaza) and April's whole generation - all the while moving one step closer to her ultimate goal: becoming the first female president of the United States. 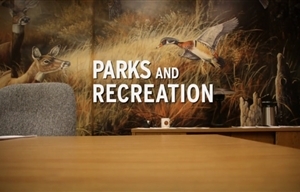 Parks and Recreation is a production of Deedle-Dee Productions and Universal Media Studios. Along with Daniels and Schur, Howard Klein also serves as executive producer for the series. Nominees for the 66th Emmy Awards were announced in Hollywood Thursday (10 July 2010). See who's made the list - and who hasn't.